Here's Tommy and Gene in action last night at New Orleans’ Woldenberg Park during KISS' performance at the AT&T Block Party! As we reported several weeks ago, KOL is now confirming that KISS will present an award at the 47th Annual Academy of Country Music Awards on Sunday, April 1. The even takes place at the MGM Grand Garden Arena in Las Vegas and will be televised on CBS affiliates around the country. KISSonline headed to a nearby rooftop to photograph and film the end of the New Orleans Block Party show from 29 floors up... and the crowd was so loud they could be heard singing high in the air. (The confetti even blew onto the roof from the stage!) Even a steady rainfall was not enough to deter the KISS Army! 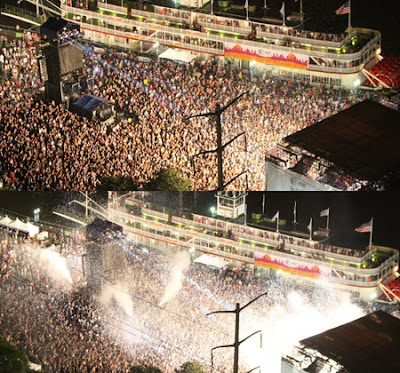 Take a look at these amazing photos of the enormous crowd rocking with KISS! 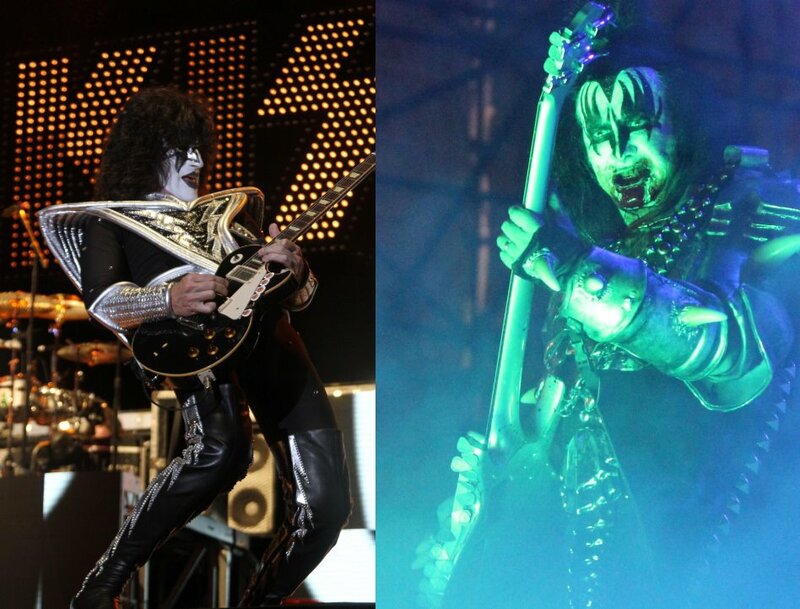 Here's KISS performing "Black Diamond" live at the AT&T Block Party in New Orleans on March 30th, 2012. Video of KISS live at the AT&T Block Party concert in New Orleans on Friday, March 20, 2012. 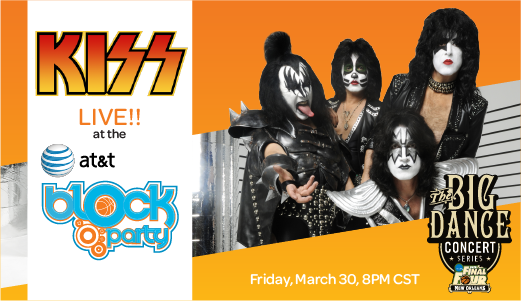 Here's video of KISS backstage at the AT&T Block Party concert in New Orleans on Friday, March 30, 2012. 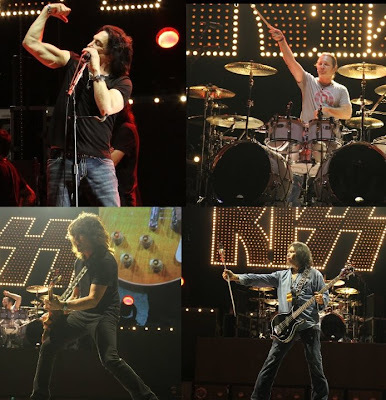 Here are a few screen grabs from KISS' AT&T Block Party concert in New Orleans on Friday, March 20, 2012. Click on the photos to view larger image. 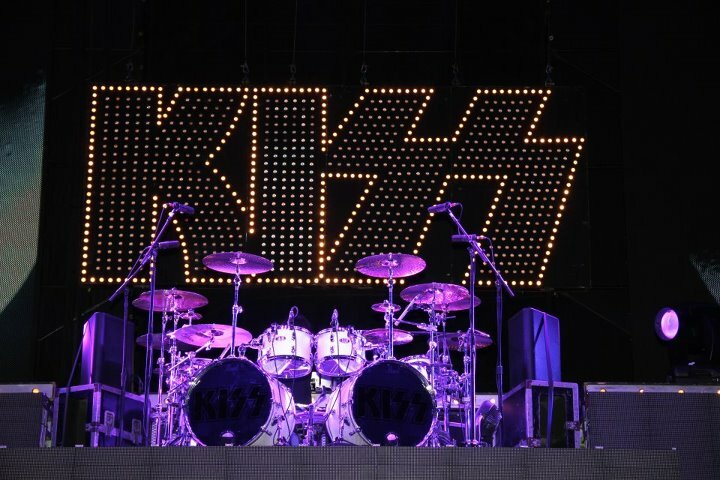 Here's a photo of Eric Singer's new Pearl reference series drum kit that he'll be using for tonight's KISS concert in New Orleans. Eric mentioned on his Facebook page that this is not "The Tour" kit he will be using when KISS and Motley Crue tour this summer. Check out these great photos of the guys rocking last night at soundcheck in New Orleans. 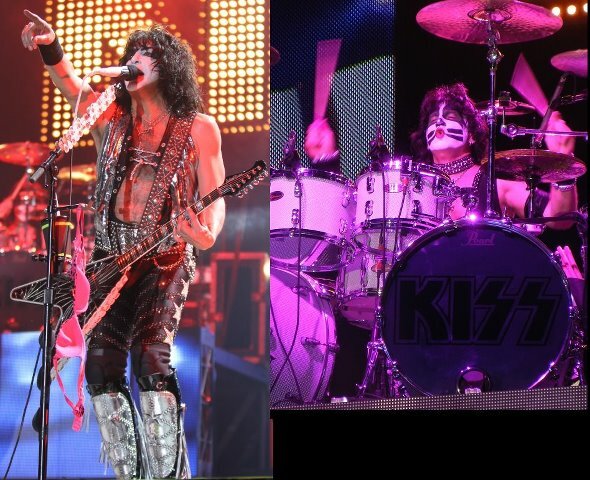 The band tore through a short set of KISS classics in preparation for Friday's massive AT&T Block Party show. Here's KISS performing "Calling Dr. Love," "Shout It Out Loud" and "Hotter Than Hell" at New Orleans' Woldenberg Park on 3/29/12. The KISS AT&T Block Party concert will be streaming LIVE on Friday, March 30th starting at 8 PM CT/ 9 PM EST at www.uverse.com/KISS - or for an interactive experience check it out live on Facebook at http://uverse.us/UVerseKISS. 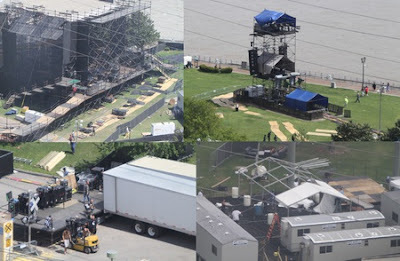 Preparations for tomorrow's massive KISS show at the AT&T Block Party continued today with crews working non-stop on different areas of the production. Gene Simmons’ slew of female groupies were no doubt taken aback when he professed his undying love to Shannon Tweed-Simmons at their televised wedding ceremony, and now Tweed-Simmons is fighting them off superhero-style in a video game inspired by her life with the KISS star. “Shannon Tweed’s Attack of the Groupies” game for iPhone and iPad was released in Canada on iTunes Tuesday. The idea for the game came about early last year, when the couple was attending the Atlantic Brand Confabulation — a networking and informational event about personal and business branding, produced by momentum Group and hosted by Shelley Chase of St. John’s — and met Gogii Games president George Donovan. Players help her by planting money trees, which can be used to buy weapons like the All-in-One remover gun (wiping the make-up and the smiles off the groupies’ faces); the Skunkinator, a bomb said to smell like skunks, rotten eggs and the soul of a gremlin; or Frank, a former secret service agent turned bodyguard. As levels are unlocked, so are photos and other never-before-seen material. Tweed-Simmons and her daughter, Sophie, did voiceovers for the game. Check out drummer Alexey covering KISS' "Unholy". Kurt Nilsen Covers KISS' "Crazy Crazy Nights"
KISS' "Crazy Crazy Nights" covered by Norwegian pop/country singer Kurt Nilsen. Kurt Erik Kleppe Nilsen won the first season of the Norwegian version of the reality television show Pop Idol, which aired on TV 2 in May 2003. He then won a one-off international version of Pop Idol, called World Idol on January 1, 2004, featuring winners of the various national Idol shows. KISS Frontman Gene Simmons on his new restaurant “Rock & Brews”. 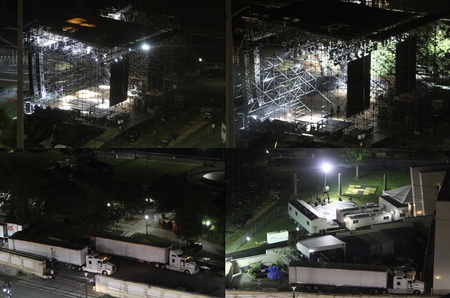 Here's the view from our hotel room last night as the KISS stage was being set up for Friday's big AT & T Block Party show in New Orleans’ Woldenberg Park. The photos were taken as the lights were being tested. You can also see the KISS trailer trucks and the trailers that will be used for KISS production offices and band dressing rooms. Kiss frontman Gene Simmons has entertained rowdy crowds around the world. Now, he wants to do it again. The legendary rocker and reality TV star has plans to open a chain of rock-themed brew pubs starting in April. Step one is relaunching Rock & Brews in El Segundo, Calif. Simmons, rock promoter David Furano and hotel and restaurant entrepreneur Michael Zislis opened the spot last March, in a location that was, "held together with duct tape and bungee chords," Zislis told Nation's Restaurant News. After the family-friendly restaurant developed a larger following than the trio expected, they decided to make a more serious investment. The brew pub idea, which was originally conceived at a Kiss concert, is not a far departure for Zislis, who has also developed the Manhattan Beach Brew Company, Rock 'n Fish and Shade, a boutique hotel. Beer will be the main focus of the revamped location, which will have an expanded outdoor beer garden and a bar with nearly 50 taps serving up craft beers. The El Segundo location will soon have plenty of company -- the team has plans to open locations in Denver, Tokyo and at Los Angeles International Airport later this year, with six more locations on the way in 2013 and hopes of ultimately reaching 50. "I have a lot of other businesses, but I’ve always wanted to do something outside the band that had to do with food and family," Simmons told CNBC. "This is a cool way to do it." While Simmons already has a number of other business ventures -- including a language-translation company, a record company and a reality show, "Gene Simmons' Family Jewels" -- he is taking an active role in the restaurant's development and design, including a "Wall of Rock" collage. He and his partners are approaching the restaurant business with similar flair and bravado that made Simmons and his Kiss bandmates legends on stage. "They say nine out of 10 restaurants fail," Zislis told CNBC. "But I say, maybe nine out of 10 people shouldn't be in the restaurant business." Eric Singer, Tommy Lee, Mick Mars, Tommy Thayer Talk "The Tour"
Jeremy Meyer from examiner.com interviews Eric Singer,Tommy Lee,Mick mars and Tommy Thayer from Kiss and Motley Crue at "The Tour" Press conference in Hollywood. The quartet discusses everything from Tommy Lee first meeting Kiss 30 years ago,bad opening acts, iconic songs and more, don't miss it!!! Who Thinks KISS Should Be In The Hall Of Fame? With the Rock and Roll Hall of Fame’s 2012 induction ceremony coming up in April, one of the stars of the rock band Kiss says he continues to be perplexed by the fact that his band has yet to be voted in. Stanley told the WSJ that he believes the Hall of Fame judges have intentionally excluded Kiss. Rock and Roll Hall of Fame media representatives did not respond to e-mail requests for comment. 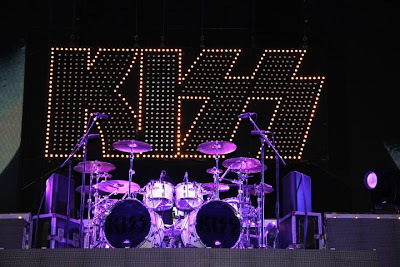 Stanley believes the organization, like some of the band’s critics, has unfairly stigmatized Kiss for its marketing-savvy. Kiss has built a multimillion-dollar business that has led to nearly 100 million album sales and the Kiss brand has been licensed more than 3,000 times. Stanley told the WSJ that he’s not just bothered by the fact that Kiss hasn’t been included. Other deserving acts have also been overlooked, he said, naming rock bands Rush and Deep Purple. He said he doesn’t consider some of the performers that have been voted in to be rock artists. Lauren Nyro, for example, will be inducted into the Hall of Fame posthumously at the induction ceremony on April 14. “I happen to be a huge fan of Lauren Nyro, who has as much to do with rock and roll as Peter, Paul and Mary do. She was a very brilliant writer, but her music is not Rock and Roll,” Stanley said. 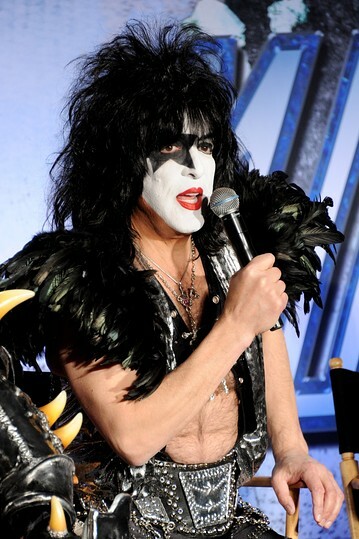 Stanley said he is excited to hit the road for Kiss’ 40-date show tour with Motley Crue that starts in July. The two bands haven’t toured together since 1982, when a young Motley Crue opened for Kiss. Stanley says that despite his complaints, he’s not going to “lose sleep” over the Hall of Fame exclusion. LOS ANGELES - Gene Simmons (with tongue in-tow...) dropped by Good Day L.A. to talk up his upcoming KISS tour with Motley Crue. The upcoming tour, simply titled "The Tour" starts rockin' July 20 in Bristow, Virginia...and scheduled to wrap up on September 23 in Hartford, Connecticut. Although the bands are officially co-headlining the tour, Motley Crue will open for KISS each night.